Hey Tom, Congratulations for the movie! Would you mind giving an e-mail adress so i can ask few questions?! Kudos Tomm! Great to see the movie's receiving the critical acclaim you and your team deserve. Looking forward to sitting through it when the work dies down. Congrats on all the well-deserved praise! Wait! You're saying you hope you and Pixar will have plans in store for The Secret of Kells starting with a screening? Awesome! Woohoo congrats Tomm, your head must be spinning - does it finally feel worth all the stress? Just watched the quick clip from the film on the late late show, that was really cool! I watched The Secret of Kells yesterday (in French, at Namur's Cameo), and I have to admit that I was truly, deeply moved by the powerful storytelling and aesthetic prowess on display. I can't get my mind off it. As a graphic designer (although a bit of a modest one), I'm amazed by the fabulous renditions of the movie's sceneries, which manages to combine the best from both styles of middle-age illuminated manuscripts and modern-day cartoons. I couldn't help but feel a touch of Genndy Tartakovsky in the way the characters and the erratic scaffolds found in many of Kells' backdrops were drawn. It's amazing how well both styles work together. Also, I have to applaud the magnificent selection of music. Aisling's song brought me to tears. You've given the world of animation a precious gift, which I hope will not only serve to amuse children and adults alike, but also provide an ideal example of old-made-new, an inspiration for artists and designers. I will definitely recommend this movie to everyone around me. Hey, this is Stella Woeste, writing from Berlin. 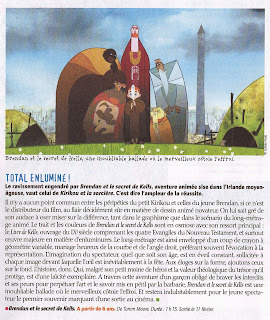 I was surprised to find myself - and thus, my film review for the Secret of Kells on your blog. Positivly surprised, actually. Thanks very much and I am glad that you received a positive reception to that wonderful movie. I also wanted to know, whether the movie will be appearing on DVD anytime soon? Wow, I just came across this merely by accident (or rather by googling my own name) and am surprised at finding my own review from the JUnge Journalisten on here. I feel quite honored to have my film critic on here, as the Secret of Kells was one of my favorite of the Kplus films in this years' Berlinale. I would also be interested to know whether the movie will be appearing on DVD anytime soon? Thanks again for the terrific movie, but my enthusiasm over it can be read above anyway.